The weekends are never long enough and the Monday morning alarm is one of the most dreaded sounds ever. If it’s a holiday weekend with Monday off, Tuesday still feels like Monday morning and that might be worse especially if you just had the best weekend ever with the best people in the universe. In order to distract myself from the dread of the beginning of the week, Molly and I spend the better part of each Monday morning rehashing our weekends and trading stories regarding the abundant activities LA and San Francisco had to offer that Saturday or Sunday, the people we spent time with, and most importantly, the food we both ate and made. Molly fully appreciates my obsessive love for all things food related: she introduced me to Shutterbean, accompanied me to the Homefries retreat in Palm Springs last fall, and many of our conversations revolve around sharing recipes and cooking techniques. A few Mondays ago, Molls and I were going through our usual Monday morning catch-up when she relayed an impeding dilemma: she was in charge of cooking dinner for her roommates AND making a dessert for her coworker’s birthday. What to make?! Her night was hectic enough with moving crazy amounts of furniture, so she wanted to make something with standard pantry items. But what to make?! 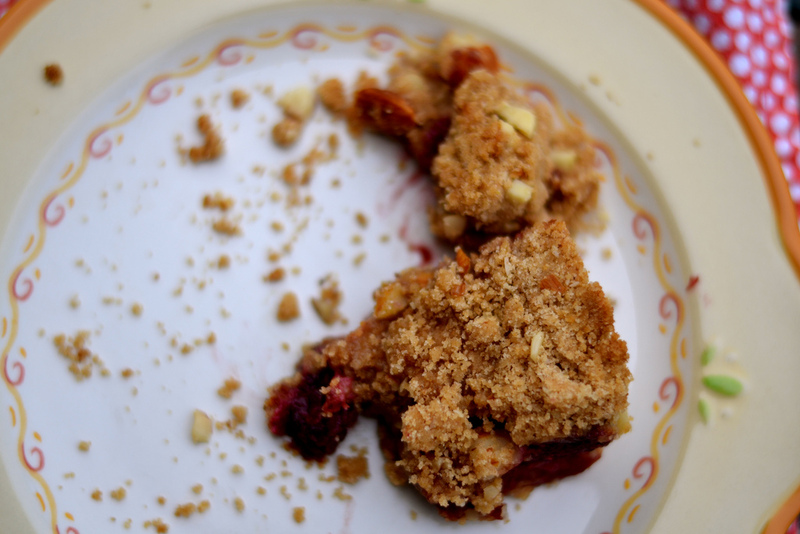 In a stroke of brilliance, Molls found these Raspberry Almond Bars on Shutterbean. They met all of her requirements: easy to make, every ingredient is household standard, and they would most certainly be devoured in record time. I realized that I, too, had all of these ingredients on hand, including a berry compote I threw together the night before, and decided to make a version of these bars, too! 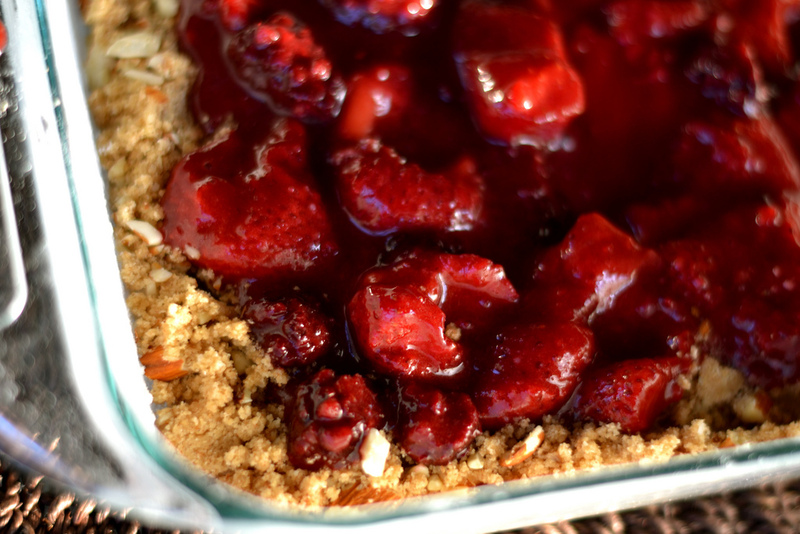 These bars really are simple, and you can use any berry combination you’d like! Berry jam would be delicious, or create your own fruit compote concoction. Since we’re getting into the most luscious part of berry season, I’d make these with some farmer’s market berries for your next Sunday afternoon barbecue. Preheat oven to 350 degrees. Butter and flour (or use non-stick spray) an 8×8-inch baking dish and set aside. In a medium-sized bowl, whisk together flour, cinnamon, salt, and baking powder. In a standing mixer (or with a handheld device), cream together butter and both sugars until light and fluffy. Beat in egg yolk until combined. Add flour slowly, 1/4 cup at a time. Stir in almonds. Gently press half the dough into the prepared baking dish. Spread the berry compote on top of the dough, leaving a tiny border so it doesn’t stick to the pan. Top with remaining dough and press down to make the top layer. Bake for 27-30 minutes until top is golden. The bars will be crumbly, so wait until they’ve cooled completely to slice them. ENJOY!! if you’re not careful, these will disappear quickly! Oh my gosh, YESSSSSSSSSSSSS!!! The berry bar post is up, and so our baking adventures together begin! I cannot wait to see where our Tuesday posts take us, Kels! There’s no one I’d rather be experimenting and documenting the journey with! Love ya! P.S. Really beautiful pictures. You’re making me drool, that compote looks divine! These look delicious. I would eat the entire pan. Aw I love that you were baking “together” and these look totally delish!